Some plants of Phacelia minor, in areas separated from the closest known P. parryi by roughly 10 miles, have corolla spots similar to those of P. parryi. 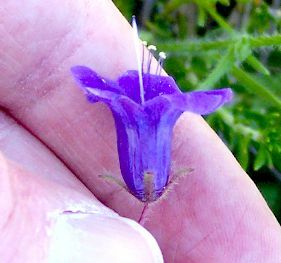 So far, fieldwork has shown that flowers with spots have shorter corolla tubes than unspotted specimens of P. minor, and sometimes also have the long-hairy filaments typical of P. parryi. One possible explanation is that these populations exhibit introgression with P. parryi; i.e., some specimens incorporate genes from P. parryi, whereas other specimens are "pure" P. minor. 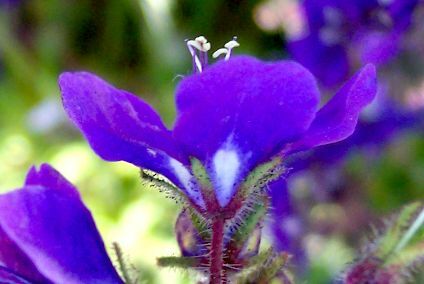 Although these plants have been found in two places separated by 50 miles, both places are on the edge of the large P. parryi population in San Diego County. It is also possible that this simply represents intrinsic variation with P. minor. Further work studying other populations farther from populations of P. parryi is needed to distinguish these two explanations. 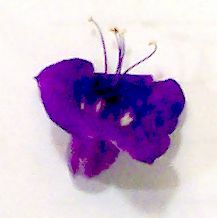 In the Jepson Manual key, Phacelia minor is said to have a uniformly purple corolla, which in part distinguishes it from the corolla of P. parryi, which has a throat with white spots below lobes. P. minor also has a long cylindric corolla tube, whereas P. parryi has little or no cylindric tube at all. On 8 March 2008, a friend asked me about specimens that appeared to be intermediates between P. minor and P. parryi, amidst specimens that appeared to be typical P. minor, in the San Felipe Valley in San Diego County. The corollas of these intermediates had spots in the throat at the base of the corolla lobes, similar to the spots of P. parryi, and the corolla tube was shorter than the specimens of P. minor without spots. 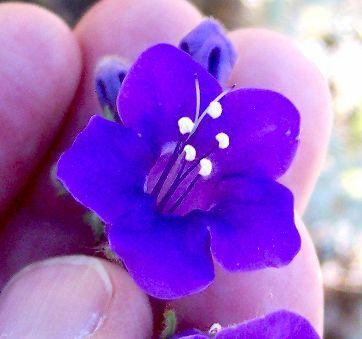 I had previously seen an online voucher of "P. minor X P. parryi" from Borrego Palm Canyon, and had always wondered about it. My friend's plants seemed potentially to be the same as the voucher. It was also possible that my friend's plants were within the normal variation of P. parryi plants, or within P. minor plants. I quickly made plans to study this population as soon as I could. By coincidence, on 10 March 2008 I found myself amidst populations of P. parryi above the Lake Hodges Dam, and P. minor along the Santa Margarita River in Fallbrook. I therefore studied those populations, and was dumbfounded to find, amidst the P. minor population in Fallbrook, plants identical to the ones my friend had found. In contrast, the P. parryi population was quite uniform, with all specimens having spots and no cylindric corolla tube. This page presents the preliminary analysis of the populations I studied on 10 March 2008. Further work will be required to understand what is going on here. I welcome any input from others, especially reports from other populations of these two species. The first set of pictures shows the population in question, flowers that appear to be P. minor but that have spots of one sort or another. These were found amidst many other flowers without spots and with longer corolla tubes, not shown in this set of pictures. The pictures on the left give a face-on view showing the spots, and the pictures on the right give an edge-on view showing the corolla tube. The pictures are not to the same scale. P. minor with spots from Santa Margarita River in Fallbrook. The next set of pictures show flowers of P. parryi from above Lake Hodges Dam. These plants were nearly dead consistent for the shape of the flower, with essentially no corolla tube and rotate except for the throat. All had spots, but the spots ranged from nearly circular to elongated streaks. The next set of pictures shows most of the samples I measured (only two flowers of P. parryi are not shown). 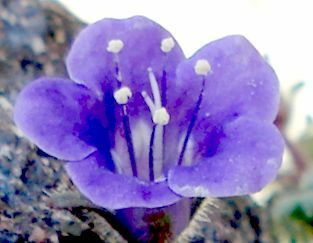 In the field, the P. parryi flowers were arbitrarily selected from a population at one location. The flowers of P. minor were taken in three or four different areas, with the first area chosen because it had flowers with spots. In the following photograph, I show the flowers after I measured them, separated by species and whether the corolla exhibited spots or not. 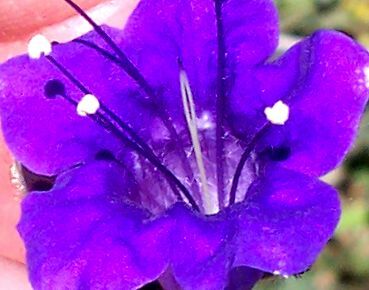 Some of the flowers with spots had extremely faint spots. The photograph was taken at night with artificial lighting. 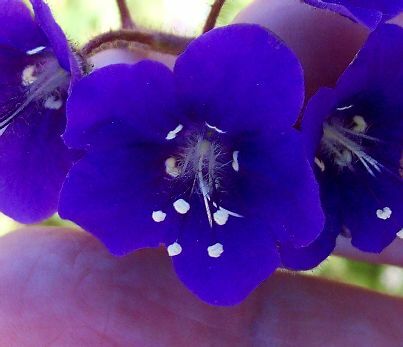 One of these flowers is also shown in the first set of pictures above, at the bottom of that set of pictures. I attempted to give a side view for all flowers, but the flowers of P. parryi won't stay on their side due to the lack of a corolla tube. The following photographs show side by side two of the measured flowers with a short corolla tube, one with spots and one without. 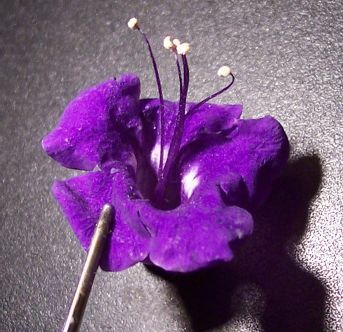 About halfway through the measurements, I found that the styles were almost exactly the same in hairiness in all the corollas, and that the minimum and maximum widths of the calyx lobes were also nearly identical in all flowers. I then stopped measuring those three characteristics for the rest of the flowers. I then did a Principal Components Analysis on eight of the ten remaining measurements. I eliminated two of the measurements because they were largely redundant to two other measures. I used the calyx lobe length and not the calyx length, and the maximum filament length and not the minimum filament length. 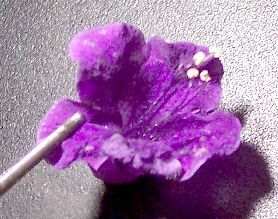 The eight measurements were the lengths of the calyx lobe, perianth along edge, perianth tube, perianth lobe, perianth across the top of the flower, style, style lobes, and longest filament. I did an additional PCA eliminating the calyx. As I expected, this gave slightly cleaner plots, since there is some variation in the calyx length that seems unrelated to anything else. All of the separation between P. minor and P. parryi, and between the corollas with spots and without spots in the P. minor flowers, is seen in the first two principal components. PCA3 yielded no additional separation. Individual P. minor points are color coded to indicate whether they have unmistakable spots, faint spots, or no spots, and whether long hairy filaments are present or not. As expected from the lack of a corolla tube, the P. parryi plants separate well from the other specimens. PCA1 is essentially a length, adding up all the measured lengths with a coefficient for each length that is determined by the correlation of the lengths to each other. PCA2 is the perianth tube length plus the filament length, minus the other measured lengths, again with a suitable coefficient scaling each length. The low values of PCA1 for P. parryi simply reflect how short the flowers are. 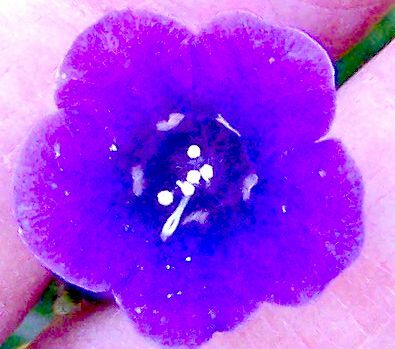 The P. minor flowers with spots are also the shortest ones in the entire P. minor population. 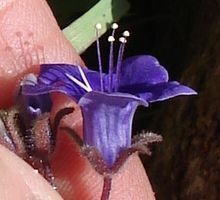 Two of the four shortest P. minor flowers have both spots and long-hairy filaments, which is expected if they were influenced by genes of P. parryi. It is interesting that four flowers from the P. minor population, all without spots, have values for PCA2 similar to the flowers of P. parryi. 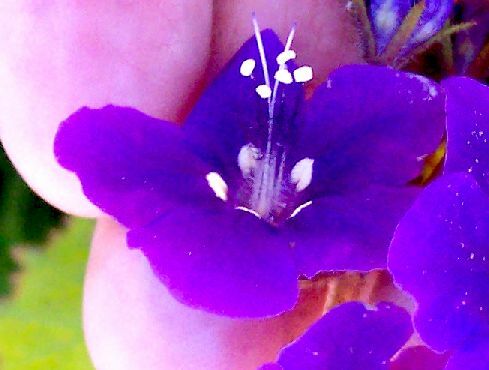 These four flowers have a range of corolla lengths from the middle of the P. parryi population to the longest values. 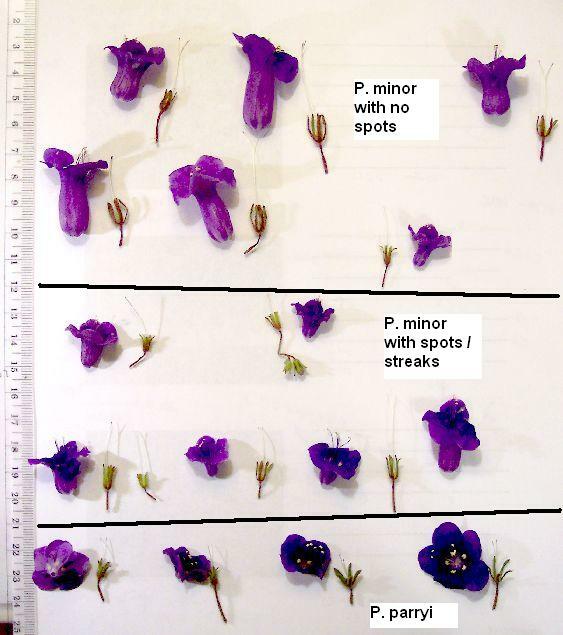 In particular, note that the P. minor flowers with spots have the largest separation from the P. parryi population. This is contrary to what would be expected if these flowers with spots were influenced by genes of P. parryi. Bottom line: The PCA does not give a definitive consistent answer as to whether the P. minor population with corolla spots is caused by introgression with P. parryi. Further field work is needed to examine P. minor populations farther from the closest P. parryi. The following plots show some of the individual measured characteristics. Using the Jepson Manual key, the P. parryi measurements are only consistent with that determination. Also, using the Jepson Manual key, the entire sampled population of P. minor is also consistent only with that determination, since every point except one falls within the key characteristics for P. minor. With this many measurements, it is quite expected that at least one point would be slightly outside the Jepson Manual range, as observed. Even half of the points corresponding to corollas with spots fall outside the range for P. parryi, demonstrating that even that part of the population is consistent only with a P. minor determination. Although the Jepson Manual key uses only the style length, the Jepson Manual descriptions give an equal separation based on filament length, shown in the next plot. The same conclusions on the determination are derived from this plot. The following plot shows the discontinuity between the tubes within the P. parryi population and the tubes within the P. minor population. The following map shows the distribution of vouchers with coordinates for P. minor and P. parryi, obtained from the Consortium of California Herbaria. Note that most vouchers do not have coordinates. For P. minor, 210 vouchers have coordinates out of a total of 489 vouchers (43%); for P. parryi, 146 out of 318 (46%). Because vouchers have not been uniformly georeferenced, one should look at the full collection of vouchers before concluding that either taxon is absent from a given area. The locations of the P. minor plants discussed above are in the two rectangles, one in northwest San Diego County and the other just to the east of the middle of San Diego County. Both populations are just outside the extensive exclusive P. parryi territory of much of coastal San Diego County, and so might well have some P. parryi genes in them. On the other hand, there are some clearly questionable P. parryi vouchers plotted in the map above, such as the ones in northern Riverside County on both the western and eastern end of the P. minor distribution there. 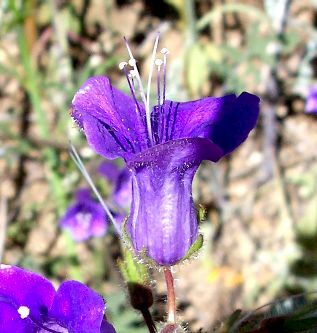 The easternmost vouchers may well be P. campanularia ssp. 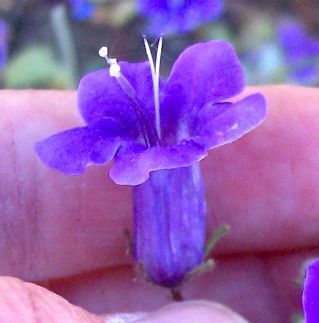 campanularia. The westernmost ones may simply be P. minor with spots, implying the spots are part of the natural variation within the P. minor population. I thank an anonymous friend for bringing specimens of P. minor with spots to my attention. Voucher data provided by the participants of the Consortium of California Herbaria (ucjeps.berkeley.edu/consortium/).